Naperville South residents rejoice, there’s a Rosin Eyecare location that’s just for you. 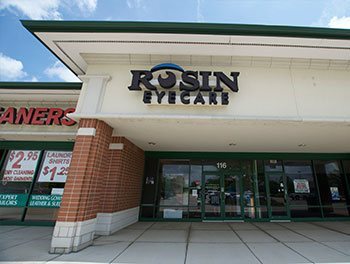 Since 1930, Rosin Eyecare has served Chicago and its suburbs with its unique combination of expert care, personal service and extensive inventory. With a staff of friendly, highly trained eye care professionals, our Naperville South office at 3124 S. Route 59 is proud to provide the same renowned service that has made Rosin Eyecare a familiar Chicagoland name for more than 80 years. From eye exams and contacts to eyeglasses and more, we have the comprehensive services and inventory you need. In addition to eye exams and professional fittings for both contact lenses and eyeglasses, Rosin Eyecare offers a large inventory of styles for men, women and children. With everything from reading glasses to special lenses and frames designed for sports and safety, we have the selection you need and the reputation you can trust. Call us today for more information or to schedule an appointment at (630) 388-0606. *From the South: From Wedgewood Golf Course head north on IL-59 N/Division St passing Target. Continue north on IL-59N/Division St past Extra Space Storage where we are located on the right next to Dance ‘n Tees Inc.
*From the North: Take US-34 W/E Ogden Ave southwest past Naperville North High School and Cress Creek Square Shopping Center. Turn left onto Ogden Ave then head south on IL-59 S. Continue on IL-59 S past Naperville Crossings and we will be located on the left next to Village Cleaners Inc.